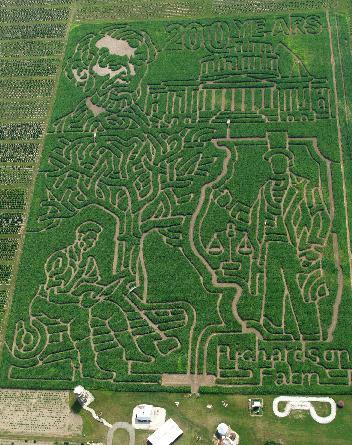 Welcome to Richardson Farm, home of the "World's Largest Corn Maze." How do they know they're the world's largest? My theory: no one cares enough to find out. For the price of $ 11.50 per adult, $ 8.50 per child 13 and under (kids under 4 free), you receive the privilege of wandering aimlessly through dried corn stalks, stepping around mud puddles, seeing nothing but corn, corn and more corn, at the mercy of the sadists who created this maze from Hades – mad farmers cackling while they stack and re-stack their gold coins. If you're like me, your eyes will glaze over while your engineer husband – who gets fired up by things like spatial logic - leads, you trailing aimlessly behind, amusing yourself counting pretzels squashed in the mud, sticking corn tassels in your hair, all the while laughing at the idiots who didn't think to bring along someone born with GPS installed in his brain. Every now and then Paul turned around to ask if I was even looking at the map. Like he doesn't know me by now. If I tell you, in no uncertain terms, to head in one direction, you need to turn around and go the opposite way. And, if I'd have recommended we go the wrong way, would he not have stepped in, preventing what would have been a horrible mistake? I think we all know the answer to that, now, don't we. My two boys – gifted with the smarts to know when they've been swindled – ditched early, finding one of the several "you are SUCH a sucker" exits located throughout the maze. But we… we went all the damn way through, punching every spot on our cards. Because punching your card at every station is so worth it, having spent MORE THAN FIFTY DOLLARS for the privilege of seeing what you could just as easily watch passing by any farm in the Mid-West, looking out your car window, whizzing past at 60 miles an hour. Clue: it's even boring at a higher speed. likely more – before you run, screaming, for the exit. My advice? Go buy a few ears of corn at the grocery store. Then sit and stare at them for a couple of hours. You'll have experienced the same feeling of excitement, and for a whole lot less money. Unless you have a burning desire to walk through mud in freezing weather, of course. Don't let me stop you. Just don't ask me to come along. But I'd be glad to give you the directions.